A great Italian meal deserves a fantastic dessert and with a few Italian dessert recipes, any meal can end with a sweet delight. Italian dessert recipes run the gamut from fine dining pastries to easy homespun cake and cookie recipes and they all taste delicious. I love ricotta cheese and find a way to get it into just about any dessert I can so, of course, this Italian dessert recipe uses ricotta cheese and is easy to put together. The best part of this cake, other than the flavor, is that it is supposed to fall slightly as it cools. So, we don't care if it doesn't rise and stay put because a bit of a fall makes this dessert look more rustic and authentic. Grease or spray with non-stick spray a 9-inch spring form pan. Spread the walnuts out on a cookie sheet and roast them for a minute or two. If you can smell the walnuts roasting, they have gone too long. 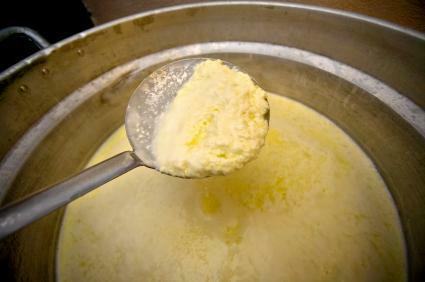 Using your stand mixer with the paddle attachment, cream together the butter and half the sugar until light and fluffy. Add the egg yolks, orange zest, ricotta, flour, and toasted walnuts. In a separate bowl, whip the egg whites and the other half of the sugar until stiff. Gently fold one quarter of the egg whites into the ricotta mixture. Carefully fold in the rest of the egg whites half at a time. Make sure the batter is level and bake for 30 minutes. Once the cake is done, let it cool in the pan and make sure the cake is fully cooled before removing it from the pan. Remove the cake from the pan before applying the glaze. Heat the apricot jam and water in a small saucepan over a low heat until very liquidy. Mix the brandy into the strained jam. Brush the glaze over the top and sides of the cake. Sprinkle the top of the cake with the chocolate. Ricotta Cheesecake - Traditional Italian cheescakes use ricotta instead of cream cheese.